Enjoy these lovely, free-spirited images by photographer Elizabeth Luna taken at a trash the dress session at Lake Arrowhead, California (yes it snows in SoCal). Elizabeth and a few others planned this amazing shoot that turned out to be so much more than they ever expected . . . I'm a redhead so these colors go with my DNA. Wondering how many out there are drawn to this combo of monochromatics. 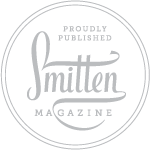 Thanks to Peri Edmonds from Melbourne who whipped up this beautiful concoction on SMP. For those of you contemplating going tea length or shorter for your wedding, Novia d'art has some of the most original looks going. The exquisite detailing as well as fabric/lace combos put these dresses in a class by themselves. 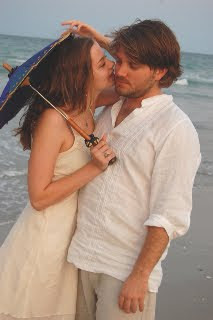 Do you recall last summer all those weddings featuring brides and their maids carrying parasols? I certainly noticed, especially after seeing that great flick, The Painted Veil with Naomi Watts and Edward Norton. Set in 1920s China against a magnificent landscape of the Yangtze River and picturesque mountains, Watts sports quite a wardrobe of these chic little props with some of the most intricate detailing I've ever seen. In 1920 however, the parasol was hardly a new concept. Going further back than Marie Antoinette, the parasol was considered a necessity in every woman's wardrobe to ward off the sun. By the mid-1800s when they hit their zenith in the Western World, it was at least known then sun prematurely ages skin. A century later we have scientific proof exposure not only ages but can cause melanoma. So our grandmothers had the right idea flaunting beautiful accessories. And so evolved the parasol; at it's most chic it can be an art form full of intricate treatments and applications just like hats, veils, purses and shoes. 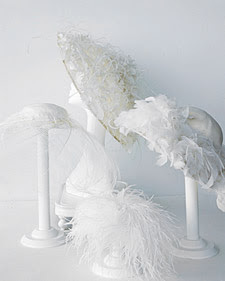 Recently, I had the pleasure of meeting Priscilla Troy of Priscilla's Parasols here in the San Francisco Bay Area. When constructed in fabric, not paper, parasols are actually made to last and make beautiful keepsakes and gifts to pass on. When Priscilla brought her entire collection in, I was amazed at the range of her designs. The collection has not only more functional products out of linen and cotton but deacquisitioned pieces from The Brooklyn Museum of Art which consisted of silk and lace gems dating back to the Civil War. Raised in the South, Priscilla moved West and pursued a career as a graphic designer and advertising art director. Today, she engages in conceptual textiles and became interested in “Shade Art” by reintroducing the parasol as both a protective devise and a fashion accessory. 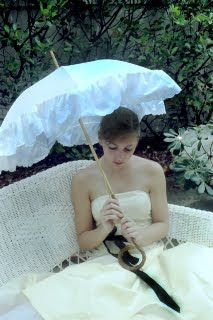 She feels, "One does not just carry a parasol, but wears it as a lifestyle choice. " 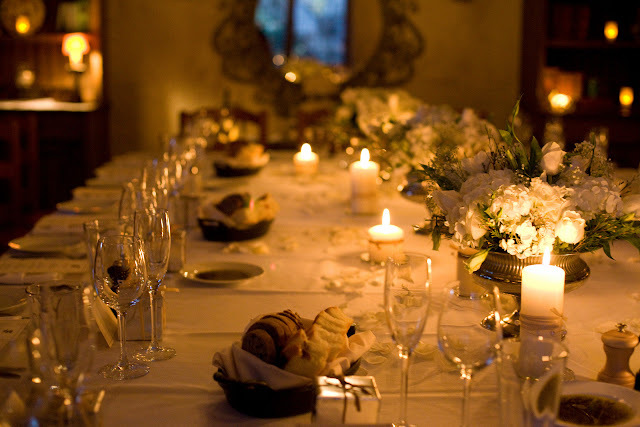 Contemplating a more romantic but simple look perchance? Check out the drop. 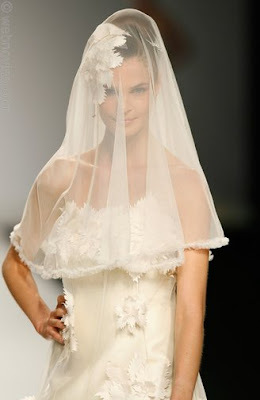 Yes, the drop veil is exactly that: actually dropped onto the head in a single layer of tulle or lace, sometimes bordered with lace or ribbon. In the above image it looks like chiffon or organza. Generally, more ornamental gowns look best with simple veils, like one layer of tulle whereas all over lace veils or ones edged with wide borders require a simple gown with little adornment. 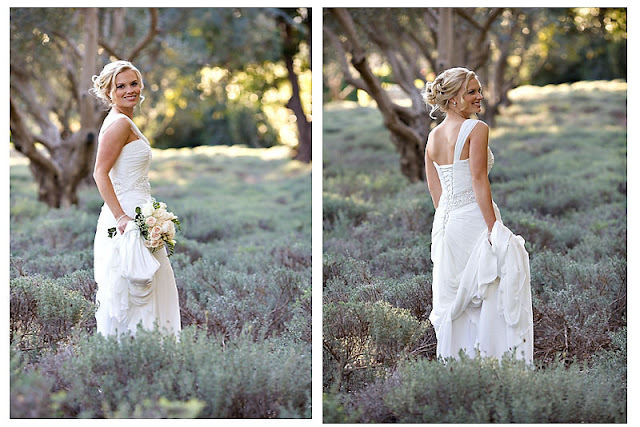 Your dress might have some exquisite back details you want to show off. 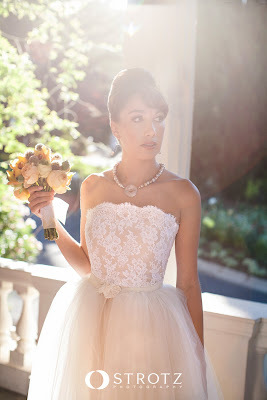 If this is the case select a try a layer of tulle like that shown in the images here— in a dropped style that doesn’t fall in creases and folds across your back. Tulle is the best fabric for this; it’s transparent enough without being so opaque to fog detail. The exquisite hair ornamentation in this photos is visible and even adds a little mystery with the addition of a drop veil . . . 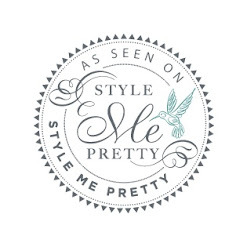 CUSTOM DESIGNED PART II: DESIGNER OR DRESSMAKER? On Friday we covered the process of making a gown from the ground up. Today we're exploring the difference between hiring a dressmaker or designer to create your vision and how to go about finding a good one. So what's the difference? 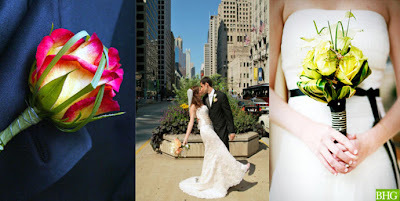 CUSTOM BRIDAL DESIGNERS-More and more have sprung up in studios and ateliers over the past two decades. They're experts in helping you translate what you see in your imagination as reality. Like a dressmaker, they work one on one with you. 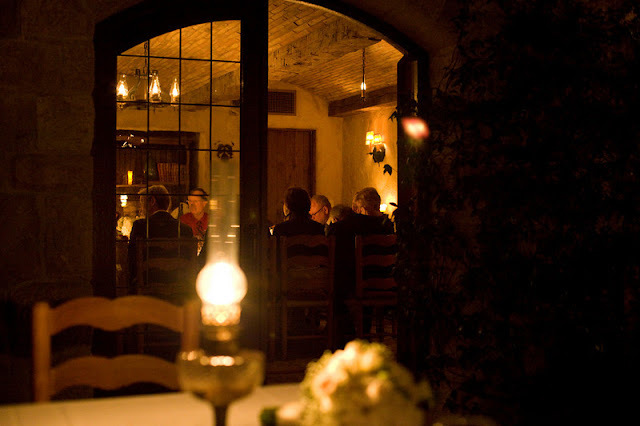 Unlike a dressmaker, they usually have tonier establishments and higher prices. The reason? 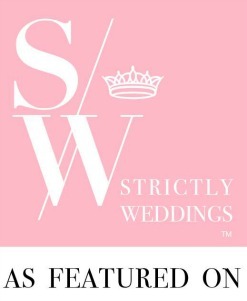 Their services are zeroed in on brides. Most offer small sample collections as well as bolts of fabric right in the studio to inspire you along with your decision. Custom designers usually work all the materials and labor into the price of the garment. Prepare to pay more here. 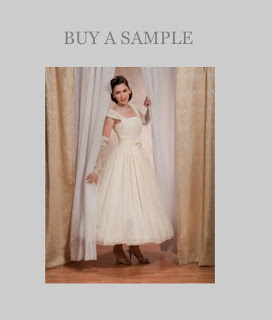 Prices can range from $1K for something simple and unadorned, up to $10K and beyond for the works: full trains, layers of petticoats, underskirts, bustles, intricate beading, etc. 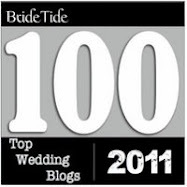 Median price range for a custom wedding gown as of this writing would be around $2-5000.00. 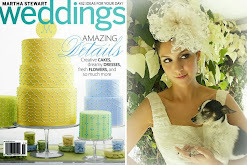 ONLINE- Most bridal designers have their own sites and more are using Etsy to promote their lines. If your heart is set on a star designer like Vera Wang and you happen to live in her area, try to make an appointment. Realize some (read: some) top designers do custom work in their flagship store. Remember though top designers get top dollar. As for custom designers without Vera's name but heavy on talent, if you're near a metro area, your chances of connecting with the right one are good. 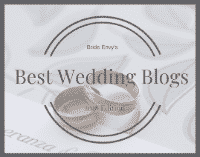 First thing you want to do is check out the gown photos the site. Is her vision and your own on the same page? Next go to her 'Real Brides' gallery . . . (if there is one) see what others looked like on their wedding day in her creations. SALONS-Bridal salons and specialty stores sometimes employ custom designers or dressmakers either in house or as outside contractors. Depending on how they are set up, sometimes they'll give a referral if it doesn't interfere with the flow of business. In the olden days (1970s and further back), most salons had an experienced staff to deal with custom evening, gala and bridal. 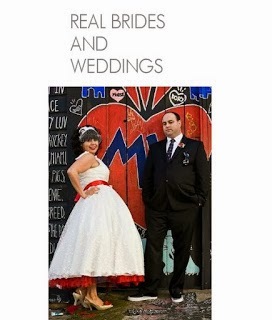 FASHION EDITORS-Fashion or wedding section editors come in two different types: Regional mags and big time bloggers. 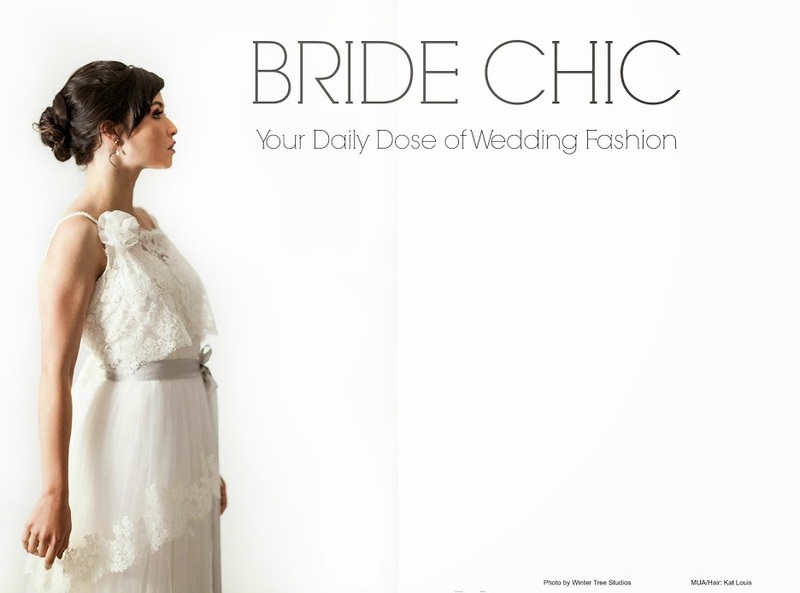 The regional mags like San Francisco Bride can be helpful if you reach them directly or run across their editorials on bridal wear. 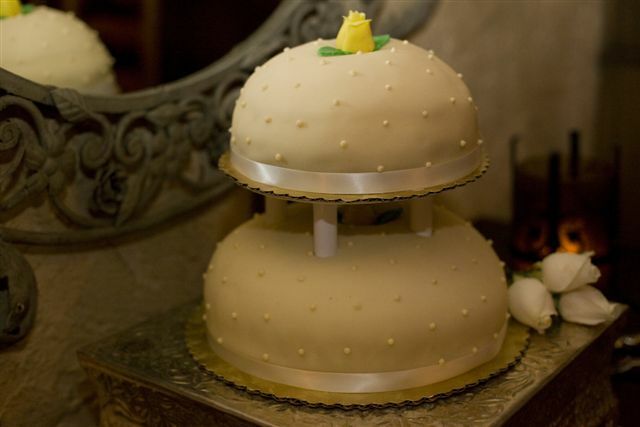 Most newspapers feature a spread on weddings twice a year. 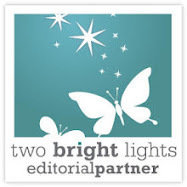 Here, private designers are sometimes featured and listed. Ask for back issues. 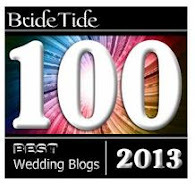 The big time bloggers you already know: Style Me Pretty, Green Wedding Shoes and Bride's Cafe to name just a few. They feature the finest and best in the industry and sometimes (mostly random) do regional posts because some designer, big or up and coming, peaks their fancy. 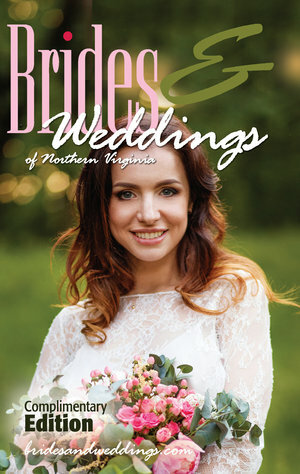 MAGAZINES-In the past few years, studio and private wedding designers have put gallery style or half page ads in some of the major bridal glossies. A few run regional sections with listings and the designer's particular specialty. Years back (like in the 80s-90s before internet) I found the only mags with these listings were the UK bridal publications. Now, thanks to the work of such publications like The Knot, these listings now exist here in the states. YELLOW PAGES-Before the internet, this used to be the first place brides looked. 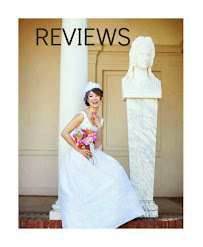 After word of mouth, this is still the best place to find a dressmaker (not designer) in my opinion because the designers have all gone online. I found this Portland designer's redesign work while cruising around the blogs. 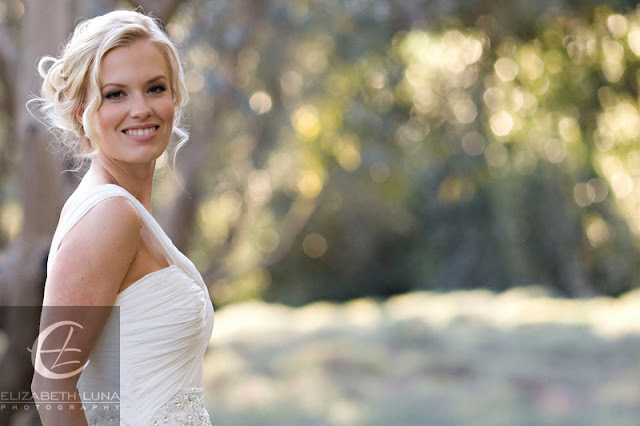 Sonia Kasparian has developed a collection of restyled wedding gowns. Because they are reworked, each and every gown is one-of-its kind, borrowed from pieces of old wedding and evening wear. Her label is Urchin though at this writing the site is still under construction. If you link through Xta-Bay here you can see more of her marvelous work. Better Homes and Gardens, known for gorgeous garden and flower features has the most imaginative bouquets I've seen in a long time . 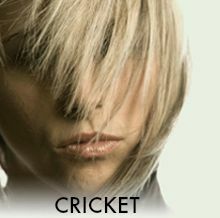 From country charm to downright exotic, check out these magnificent combos I found on their site. Finding an inspiration point and blending that idea with your dress is just the beginning of working one or a few colors into an overall theme. The dress above is paired up with a bouquet of Celadon hydrangea clusters and hypericum berries combined with soft yellow orchids, chrysanthemums, and peach-pink roses. Loops of rich green grass encircle this creamy clutch of flowers. 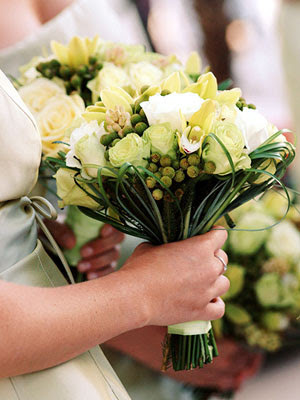 Pure white roses are nestled alongside yellow-tint orchids and roses with pale green petals. Soothing green foliage and berries unite the bunch. 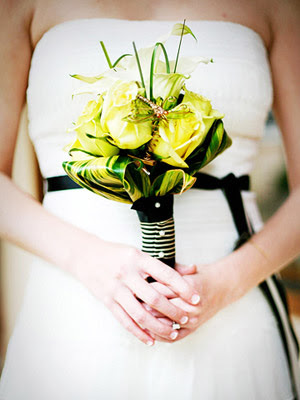 The evening gowned or beach bride will love this tropical bouquet. 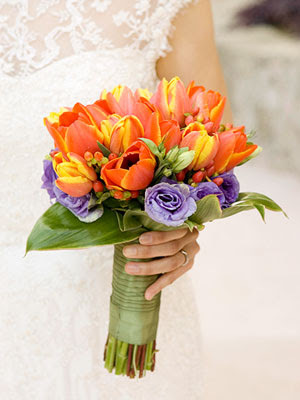 To add an island or beach vibe to your wedding, use bold colors like these orange tulips surrounded by lisianthus. Believe me, this is just the beginning of all the fabulous flower chic. 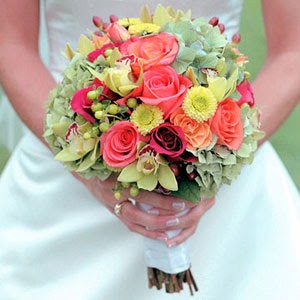 To find more bouquet inspiration you can hop over to BHG's Editor's Picks . Maybe you've narrowed down your search--decided you like the evening gown look but not absolutely, positively, 100 per cent sure an A-line is out of the question. Next you get up from the computer and go out shopping. Hitting every salon within a twenty-mile radius, you try on gowns in every shade of white imaginable. Still, nothing out there's really grabbed you. Then . . . a week or two later this concoction finally comes together in your head--the neckline you found in Weddings; the sleeve on the dress you tried on in the salon combined with the sweep train you spotted last week in the Film Noir. Once all this gets put together you'll have a custom designed gown, something one-of-a-kind like no other in the world. The inspiration boards above and below were put together to illustrate some of the steps in the design of a custom gown from first sketch, fabric and laces used as well as finished product. REALITY 101: Making a gown from scratch requires more fittings than gowns ordered through a salon so you'll need to be open to the experience of watching your gown develop from the ground up. In addition, a custom designer or skilled seamstress puts many hours and a high level of craftsmanship into the creation of a custom gown. 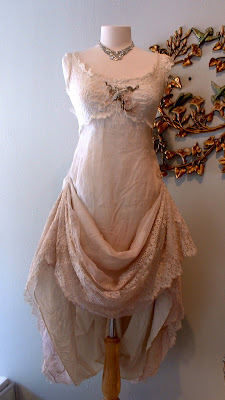 Working with fragile white fabric and delicate lace is an art form. Figure any custom gown crafted by a designer usually takes four to six months to complete from a listing of your measurements. Since the design process involved with a custom gown is more of a direct collaboration between you, you'll have more input with decisions regarding fabric, silhouette and style. 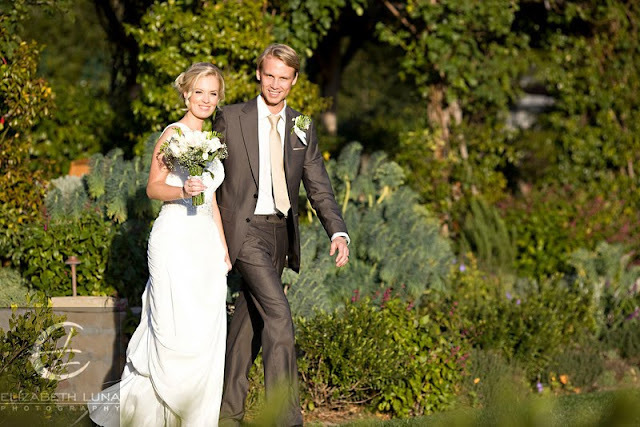 Custom gowns are typically 80-90% handmade. This means machines do some work like the side seams, cross seams, etc. There are however stitches on these one-of-a-kind gowns only expert handwork can touch in order to produce that exquisite finish. Eventually a gown is in the making. After a final sketch is approved, a written estimate follows, complete with with fabric swatches and your measurements are taken. For every gown order a paper pattern is made. Think of the paper pattern as a blueprint, a record of all your dimensions on it. From this, most designers (some dressmakers too) work out a muslin. The muslin is an actual cotton mock-up and 'living pattern' of your gown's design, fitted exactly to your body. Think of your muslin as the foundation--the groundwork upon which your dress will be built. This is where most of the fine tuning will be done to that perfect fit before one cut or stitch goes into the true gown fabric(s). Check in for Part II of Custom Designed on Monday . . . Remember these? Powder-puff marabou mules were once the chi-chi footwear reserved for lookin' good in the boudoir, worn almost exclusively with negligee and penoir sets. 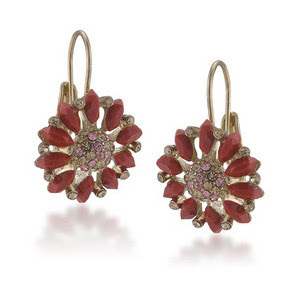 Popularized by Jean Harlow in the 30s, they were trendy all through the 50s and early 60s. 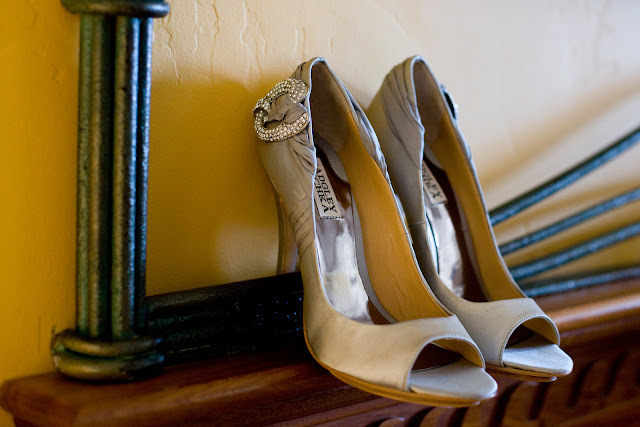 Now they can be flaunted and worn out to the most glam events- your wedding included. 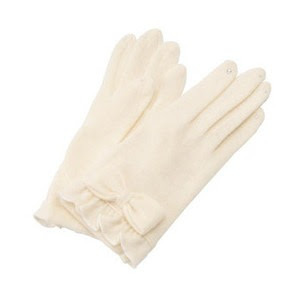 Shorties like these are those very lady-like gloves everyone wore to church in the 1950s. 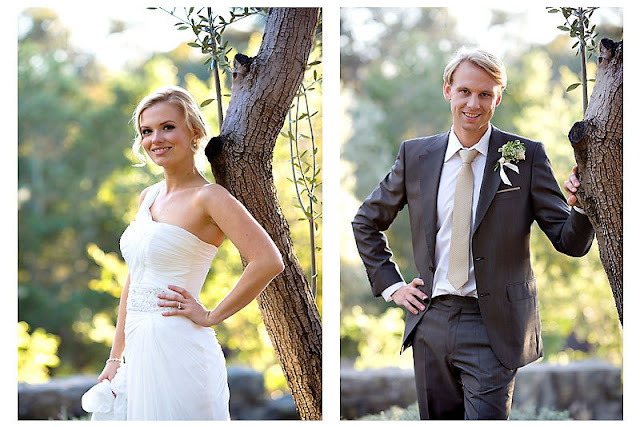 Mostly paired with daytime attire, they could go from afternoon formals into the early evening. 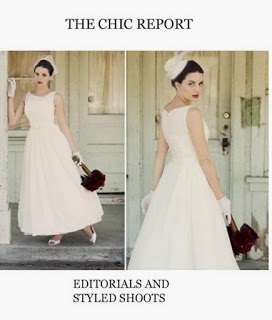 These days they actually look chic with all styles--sheaths, A-lines and ball gowns. A delicate limited edition headband, the warm metallic and chiffon fabric is complimented by gunmetal and bronze coloured wire. 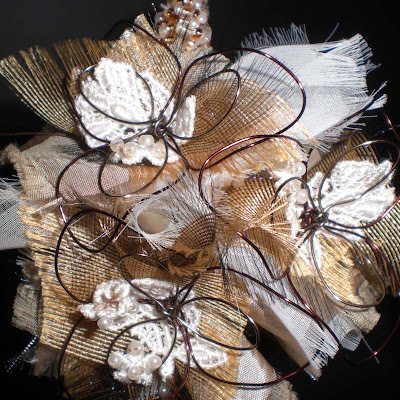 Ivory beaded band featuring a bronze and gold cluster beneath the fabric flowers. 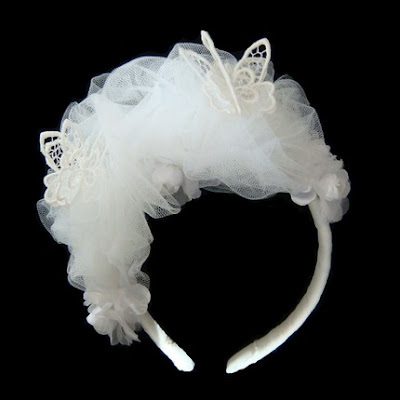 Covered with layers of white tulle this headband features beautiful handmade antique replica double butterflies and satin flowers adorned with faux pearls. 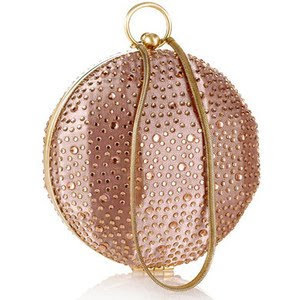 Bonus chic: There is a little blue Swarovski crystal for luck hidden inside the flower . . . . 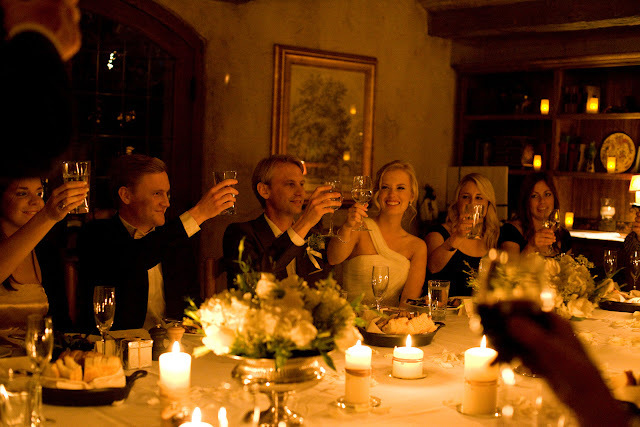 Yes, this wedding is recent--Jan 10. San Ysidro is right on the Mexican border which explains the sunny, warm feel of these images by the very talented Riverside, California photographer, Elizabeth Luna. 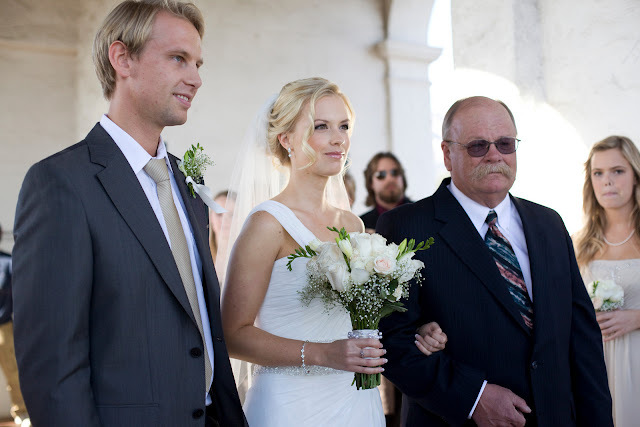 Says Elizabeth about this wedding, "Chris and Sarah met in Sweden while she was in college there. 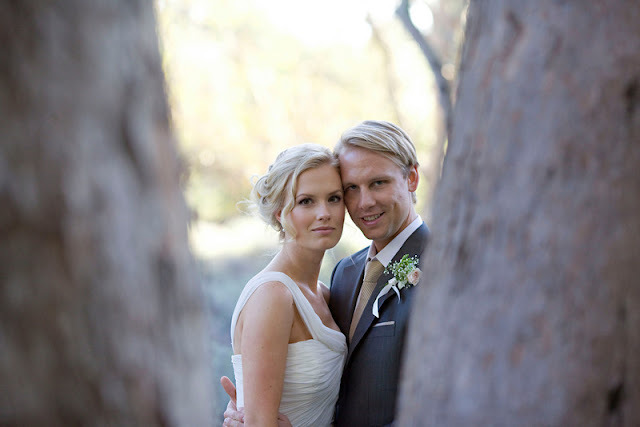 They had a long distance relationship for several years until last Saturday when they tied the knot! I am so grateful to begin the new year documenting this moment. The love they have for each other is quite obvious! Gosh I LOVE my JOB! Chris and Sarah thank you for being you! Thanks for having such awesome personalities and being so loving and open. I felt like part of the family. Thank you to the following people for making all of this possible. . . . "
are, their personality, laughter and free spirit through the magic of her lens . . .